If you wish to use any of the inland waterways in the mainland United Kingdom, then it is important that you know about the main organisations that oversee waterways operations in the UK. The Canals and Rivers Trust and the Scottish Waterways Trust are two of the current leading organisations that help to ensure that people can make the most out of the canals and rivers. Both of these organisations were devolved from The Waterways Trust in 2012. The Waterways Trust was originally established in 1999 as a registered charity that aimed to support the value and enjoyment of the British waterway network across Scotland, Wales and England. It served to act as a charitable arm for British Waterways. As well as running various awards and grant-making schemes to support local waterways, The Waterways Trust also helped to operate the National Waterways Museum at Ellesmere Port and other waterways museums around the country. In 2012, The Waterways Trust was merged with the Canals and Rivers Trust in England and Wales. Operations continued in Scotland, with this part of the organisation being renamed as the Scottish Waterways Trust. The Canals and Rivers Trust was formed in response to calls for waterways users to have an increased say in the way that British waterways were governed and run. Government funding for maintaining rivers and canals was cut in the midst of the global financial crisis and many waterways users were concerned about how the budget was being spent. It was decided that British Waterways should inherit the running of all inland waterways in England and Wales, and that the trust should be given charitable status to help to improve funding and operations. British Waterways continued operating in Scotland under the trading name of Scottish Canals. The trust is run by a council of 35 members. The current member list is made up of a mixture of nominated and elected individuals. There is also an unpaid board of trustees who are legally responsible for ensuring that the Trust continues to work towards its stated aims. Operations are further devolved into 11 regional offices, namely; East Midlands, Kennet & Avon, London, Manchester & Pennines, North East, North West, North Wales and Borders, South East, South Wales and Sever, and the West Midlands. The Canal and River Trust is currently in receipt of a multimillion pound per year grant from the Department for the Environment, Food and Rural Affairs. It also secures additional income from utilities companies that rely on the waterways network to operate successfully. Rental incomes from riverside properties, as well as mooring and passage fees from boat users also contribute towards the overall total income of the Trust. The Trust also accepts donation from people who enjoy the canals and rivers of the UK and want to support their maintenance and development. High profile charity supporters include HRH The Prince of Wales. The Canals and River Trust is committed to developing the past and the future of England and Wales’ waterways, so that they can continue to be enjoyed by everyone across the country. For example, many of those who use the canals in their own towns do not actually understand the historical significance of the structures. The Trust campaigns to promote an understanding of the roles that canals played in the industrial heritage of the United Kingdom. In addition to developing the human use of our waterways, the Trust is keen to protect the native wildlife which also enjoys the water and the surrounding riverbanks. One of the most prominent nature campaigns run by the Canal and River Trust is the campaign to keep ducks (and other water birds) healthy. Feeding the ducks is a very popular pastime in the UK; however it is one which is actually causing a lot of damage to our wildlife. White bread is very bad for ducks and can cause them to suffer from a wide range of different health issues. The pastime is also changing the behavioural patterns of animals, which have started to see humans as a vital source of food. Although the Trust does not want to completely stop people from feeding the ducks, it is promoting seeds and feeds which do not pose serious health risks. In some popular areas, the Trust has created feeding zones where people can buy special foods to feed to the birds. The Scottish Waterways Trust became an independent charity in 2012 when the English and Welsh branches merged with the newly formed Canal and River Trust. Like its counterpart, the Scottish Waterways Trust also has HRH The Prince of Wales as its patron, however; the Scottish Waterways Trust is forced to rely more heavily on funding from donations. The Scottish Waterways Trust has invested a lot of its resources into promoting waterways to young Scottish people, so that they can develop a full understanding of their importance from a young age. A “Canal School” is operated to allow visiting primary-aged children to get a hands-on education centred around the importance and history of Scottish waterways. In one of the organisation’s pioneering projects, known as Canal College, people aged 16 – 30 are given skills and employability training to help to improve their prospects for the future. Although the lessons and exercises are based around outdoors heritage, the skills which are developed are transferable one, so that they can be used anywhere in the world of work. This entry was posted in Canals on 17/10/2017 by British Canals. Spending time on the British waterways can be an incredibly pleasurable experience. Canal boat users should make sure that they have fun whilst staying safe by ensuring that they follow general rules and regulations. These rules are designed to protect those who use the canal towpaths, as well as those who travel on the waterways. It should go without saying that canals and canal boat safety is vitally important both to you, other crew members and visitors alike. However the safety of any visitors on your boat should be a top priority as they may not be used to the hazards that canal boats and canals may present. Not only that but if a crew member or visitor to your boat were injured and decided to start a personal injury claim against you and you were found to be negligent it could be a very costly lesson. Whenever you are moving about on or near to the boat, you must be aware of slip or trip hazards. The deck of a boat can become quite slippery when it is raining or when the deck has been splashed with water. Wearing non-slip shoes can help to reduce the danger. You should also pay attention for ropes, bollards and cleats which may be classified as trip hazards. Never try to fend off a moving boat with your arms or legs, as the weight of the boat could crush you. Fenders (also known as bumpers) should help to reduce the impact and protect the boat from damage. Stay off of the roof of the boat whilst the boat is in motion, because trees or bridges could easily knock you off when the boat is underway. Always take care when you are using cooking gas or portable heaters on the boat, because leaks are possible. Flu-like symptoms, nausea, dizziness or tiredness could be symptoms of carbon monoxide poisoning. If you suspect carbon monoxide poisoning or if you are worried about inhaling any other fumes, you should see a doctor immediately. Ventilate the area and do not do anything that is liable to create sparks. Remember that carbon monoxide is odourless, so you will not be able to smell it. Check all safety equipment before setting off on a journey. Make sure that you have enough fuel and run the engine for a few moments before setting off. Most boats will be moored using at least two mooring lines (ropes). Start by untying the rope which is downstream. You should only untie the upstream line once you are ready to set off. You may need to push away from the bank to get the boat into clear water. Whenever you are underway, you must always drive on the right hand side of the waterway. You may proceed in the centre of the channel if there are no other boats around you. Always pass approaching boats “port-to-port”. Never try to cut corners when going around the bend as this puts you at increased risk of collision. Move at a slow speed when passing other boats or people using the waterway for recreational pastimes. A breaking wave or large bow wave created by a speeding boat can put swimmers, canoeists, anglers and the river bank at risk of harm. Boats must not exceed 4mph when travelling on a narrow canal. The speed limits on broad canals are variable and they should be clearly marked. In some circumstance, you may need to approach a stationary dredging boat. The dredger should have clear marking or symbols to show boats which side to pass on. Alternatively, they may have a works crew member issuing instructions. Follow these instructions for your own safety and the safety of the dredger crew. Try to see whether tunnels are clear before entering them. Signal a long blast of your horn before entering and reduce speed to a minimum. Use your headlights or a high-powered torch to help to make others aware of your presence. If you are following another boat, try to allow them to pass at least 2 minutes ahead of you. Headroom within tunnels can be variable, so try to maintain an awareness of the height of the tunnel roof, especially close to the edges. It is best for all non-essential crew members to stay inside the boat to reduce risk. You should always be aware of the weather conditions whilst you are underway, as this can make steering more difficult. Winds can blow the boat off course, so you may need to compensate for this whilst you are steering. Strong winds can also mean that hazards on the bank begin to behave in more unpredictable ways. For example, tree branches may be blown into your path. Pay attention to where you moor up. Some sections of the riverbank or canal bank may be private property and will not accept visiting boats. 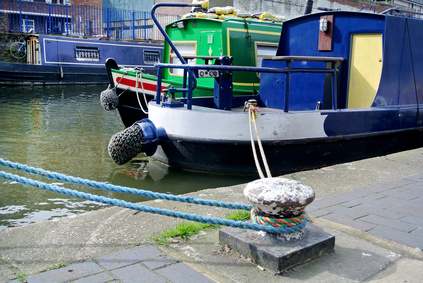 Most towpaths clearly label visitor mooring areas and provide an explanation of mooring lengths. If there is no sign, then the generally accepted mooring time is a maximum of 14 days. Even if there is no sign, you should avoid parking near locks, under bridges, near to weirs or close to turning points. In flowing water, you should always park with the bow of the boat pointing upstream. You may need to drive passed your intended mooring site and turn around in order to achieve this. Locks can be very dangerous so it is important that you know what you are doing before attempting to use one. Although some locks on British waterways are operated by dedicated lock-keepers, most of them are designed to be operated by the skipper of the boat. There should be a competent person on board the boat and operating the lock. If there is a lock-keeper, you must make sure that you follow their instructions. Always check the water level in a lock before approaching it with the boat. If the water level is equal with the water level in the canal, then it will be possible to open the gates and sail straight in. If the lock is full, then it will need to be emptied before the gates are opened. Parking the boat away from the lock will help to avoid dangerous currents. Always check that there are no other boats waiting to use the lock before you begin to empty it. Ensure that the paddles on the top gate are fully closed and then slowly raise the bottom paddles to allow the water to empty from the lock. Once the water has emptied it will then be possible for you to open the lock gates and safely steer the boat into the lock. You should then fully close the lock gates and all of the paddles. Very slowly and carefully open the paddles on the top lock to allow water into the lock. Opening the paddles too quickly can cause the water to flood into the lock which will destabilise the boat. Once the water in the lock is at the correct level, you will be able to open the gates again and navigate safely out. If the water is not at the correct level, it will make it very hard to open or close the lock gates. Whenever you are using locks, you should be aware of the placement of the cill. A cill marker will normally show where the cill comes out to. If you are not careful with your boat placement, the boat may catch on the cill as the water level drops and this can cause damage or destabilisation. It can be very dangerous if someone falls into a lock. Immediately close all of the paddles to stop the water flow. Throw a lifebouy or lifeline into the water and turn off the engine of the boat. Do not jump into the water to rescue someone who has fallen in, because this can make the situation even more dangerous. If possible, use the livesaver tools to guide the person towards the lock ladder. If there is no ladder, then the water level may need to be raised very carefully. Use the tools to guide the person away from the influx of water. If someone goes overboard, it is important to get them out safely and quickly. Put the engine out of gear and be aware of the risks posed by the propeller. Throw a lifebuoy to the person in the water. Use the lifeline to pull them towards the side of the boat and then help them aboard. Make sure that you always use the correct tools for the job, because using the wrong tools can be dangerous. For example, using the wrong type of windlass on a lock can allow the ratchet to slip. Poor rope handling skills can lead to rope burn and crush injuries. Never discharge toilet waste into the waterway. Use a pump-out facility or sanitation station to empty any onboard toilets. Grey water from sinks or showers may flow directly into the waterway, so be mindful of the substances which you pour down the drain. Only use phosphate-free cleaners and detergents whilst you are on the boat. Do not throw any litter overboard, including “biodegradable” matter such as fruit peel or apple cores. When cruising in winter, you should take extra precautions when out on the canal. Always wear a lifejacket as the cold water can reduce your ability to swim and you may lose consciousness quickly. Be careful of slippery surfaces on the boat. Always wear gloves to try to maintain maximum control.